Make slightly bigger little games. Is 8x8 1bit pixel art feel just a wee bit too limiting? Ever wished to make Bitsy games with just a little bit bigger graphics? Well, worry no more, because now you can! 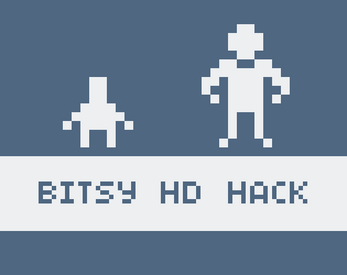 Bitsy HD (hacked hardly higher definition) is a modified version of Adam Le Doux's brilliant Bitsy Game Maker. As of now, it only changes the tile resolution from 8x8 to 16x16 pixels, apart from that it works like the classic Bitsy you know and love. More features might be implemented in the future. Run it on itch and use it as you would standard Bitsy. Because of Chrome's safety features, local Bitsy might misbehave when run in Chrome. If you have never used Bitsy before, check the About tab in the editor! The changes in Bitsy HD make the game data incompatible with standard Bitsy. Copying HD code into standard Bitsy will work, but your tiles and sprites will only show top left quarter of the sprite. Copying standard data into Bitsy HD might make it unresponsive. Best course of action is to never copy standard sprite/tile data into the HD editor. Adam Le Doux - The Brain behind Bitsy! Fred Bednarski - Haphazard Hacks! Bitsy Discord - Eclectic Encouragement! Hi! I think this is such a great tool... except that it doesn't seem to work for me. In the paint & room box, all it is showing me is a black screen within the window, with no options to edit or make samples of pixel art for the room, sprite, etc. Even animation button won't dropdown or show frames. I even downloaded the offline editor but it seems to not work for me either. Hope you can help? Thank you! Sorry to hear that. This was a bug when 8x8 sprite data found its way into the editor - but I guess I haven't fully solved it. It works on my end, so I assume this is something to do with the browser data. Click around the GUI in the "blank spaces" between windows and the Sprite window. (I am not sure why this would work, but it did when I was tackling this bug previously - I think it has something to do with refreshing each bitsy panels). Try a different browser, preferably one you have not used any bitsy editor in. OPTIONAL, because it is more advanced and it can delete some stuff - delete web storage for your browser(s). If anything else fails and you really want to make a bitsy like game a resolution different than 8x8, try môsi! Thank you so much for the reply, I really appreciate it! I'm gonna try to work my way around this bug; it seems to work well for my friends that I've linked it to but not for me. But I will definitely try your suggestions. I've also looked into mosi, it seems pretty neat! Can you submit this as an official engine/tool? I am making a game and in the metadata I can submit what this was made with and you should submit this engine by clicking here. It would be nice but I'm not trying to put any weird pressure on you if you don't want to. Of course. Both the original engine and this hack are incredible! This is honestly incredible, thank you.